This week, Stephen, our Archive Assistant tells us about the work he is currently doing to review part of LHSA's photographic collection. LHSA holds a large collection of photographs, some have been fully catalogued, some are part of an old card index, some haven't been catalogued at all, some are buried within the main body of Archive collections! Hence, finding a particular image can be very difficult and very time-consuming. I am currently auditing the 'old' photograph card index. 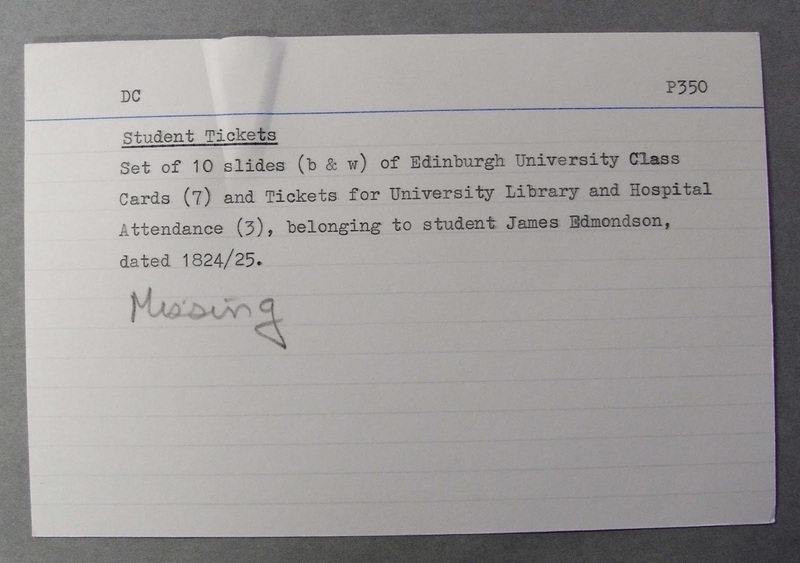 Before computer cataloguing systems were used, photographs held by LHSA were recorded by means of a typed index card for each photograph or group of photographs, with a reference number and brief description. There are probably about 1,000 index cards, some have been marked to show that the photograph(s) in question is missing. To carry out the audit each index card is typed into a spreadsheet and the corresponding photographs are checked to see if they exist and that their description is accurate. The reason for the audit is twofold: It is very useful to have the data held on the index cards in digital format which can be searched electronically by keyword; and also, the information in the cards can be incorrect so I am creating a much improved and accurate photographic finding aid. 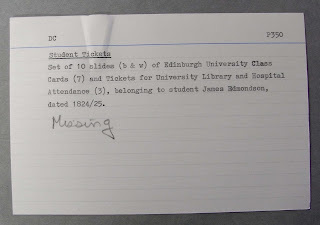 As the information is typed up, I am adding other useful information to the descriptions, for example: index terms (people or hospital names), information about duplicates, cross references to digitised slides, links to SCRAN etc. In this way it will be easier to find images on a particular topic for enquirers and to locate the original prints and negatives from digital copies. 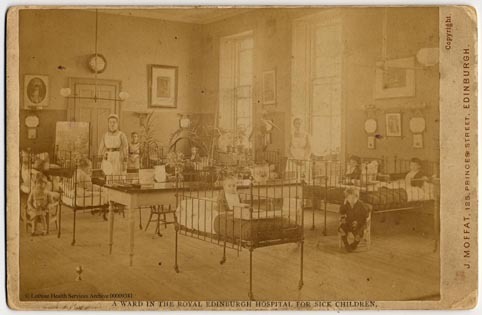 I recently finished cataloguing a large collection of assorted patient registers that were transferred to us by the Royal Edinburgh Hospital for Sick Children. We knew that some of the volumes may have come from other hospitals in the region but unfortunately we didn’t know which ones! I started happily cataloguing in-patient registers, operation books and others until I came across three volumes with the title ‘Children’s Unit Admissions Book’ dating from 1965-1974. This was where the mystery began - I thought it was a bit strange that a children’s hospital would have a 'children’s unit' so I wondered if they came from another hospital but the books themselves gave no clues! I looked through the catalogues of our other hospital collections but they didn’t seem to fit anywhere. I had drawn a blank until I notices that one of the columns in the 'Children's Unit' volumes was headed ‘parent hospital’ and seemed to be the name of the hospital that had transferred the child to this unknown unit. So, in an effort to solve the mystery, I picked out a few names of patients who were noted as being transferred from Leith Hospital as the 'parent hospital'. Luckily I was then able to find entries for these patients in the admissions registers from our Leith Hospital collection (LHB6). Two of the patients had the annotation 'AAI' next to their names..... Astley Ainslie Infirmary, meaning they had been transferred from Leith Hospital to the 'AAI'! At last – I could catalogue the Children's Unit volumes into the Astley Ainslie Hospital collection (LHB35) and be confident they were in the right place ready for any future researchers or enquiries. There are often many cross-overs in our hospital collections, due to obvious links between hospitals and changes in administrative structures over the years, sometimes it just takes a bit of detective work to sort them out! This week, Ruth, our Paper Conservator, tells us about LHSA's surrogate production programme. LHSA has a well-established programme producing surrogates (or second copies) of key items in the collection. This means that the important information held in the original item is also kept in another format: preservation belt and braces! 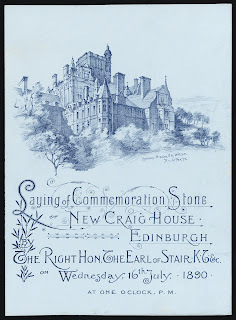 In the past we have created microfilm versions of iconic items, however, we have recently started an interesting new project focussing on the large series of patient case books (1840-1930) of the Royal Edinburgh Hospital. This project produces the traditional microfilm medium for long-term preservation along with TIFF images for easy access and use on the web. The Royal Edinburgh Hospital collection is LHSA's most used set of records in academic, family and local history research. 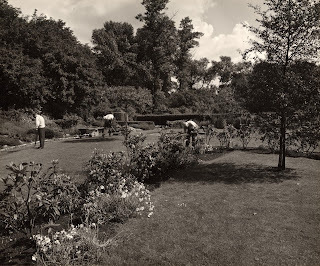 Garden created by REH patients at Mackinnon House, 1950s. So far, microfilm copies of the first two volumes of the case books series (1840-1845) have been produced, and from those microfilms TIFF images of every page in the volume are created. The work is complicated by the fact that each case book also has a number of enclosures (patient letters, drawings, test results etc.) that are stored separately. Each original volume and its enclosures have been imaged to ensure that the enclosures relating to a particular patient appear next to the relevant patient record in the volume. We will promote use of the microfilms and TIFFs for research use in the first instance in order to limit wear and tear on the original volumes. Using the TIFFs, we hope to make these case books available online to facilitate easy access to this important and regularly used material. Access to all patient records is managed in accordance with the Freedom of Information (Scotland) Act, the Data Protection Act and the NHS Records Management Code of Practice. LHSA would like to wish everyone all the best for a happy 2011! Laura, assistant archivist, is already dealing with some new accessions to the Archive. Alison, assistant archivist is continuing to catalogue our HIV/AIDS related collections. 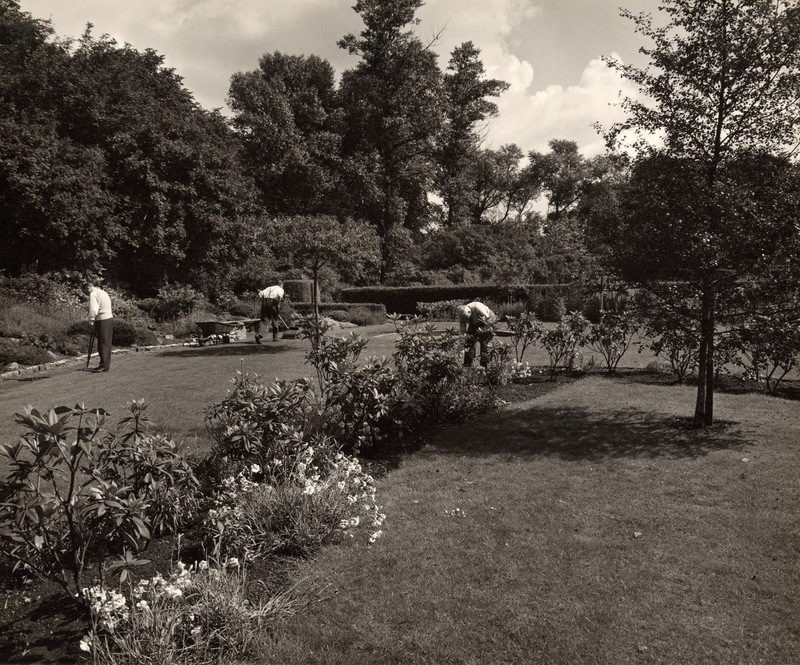 Stephen, archive assistant, is cataloguing photographs and writing a 'Spotlight On...' for our website. Ruth, paper conservator is planning for LHSA's involvement in the 'Unsung Heroes' project (see blogpost 3rd December 2010). Rosie, assistant archivist, is preparing a funding bid to the Wellcome Trust Resources for Research in Medical History scheme. We will keep you posted on our progress throughout the year via this blog! This image, from our Royal Edinburgh Hospital collection (LHB7/16/7(2)) has been used in one of our newly commissioned promotional postcards.